PBX / PABX. 3CX’s IP PBX has been developed specifically for Microsoft Windows and is based on the SIP standard, making it easier to manage and allowing you to use any SIP phone (software or hardware). ● No need for separate phone wiring – phones use computer network, easy hot desking! ● Save on monthly call costs using SIP trunks, VoIP providers or Skype Connect! Take a look at the brochure or download the Free edition today and break free from your proprietary PBX! 3CX Phone System for Windows is a software based PBX for Windows that works with SIP standard based IP Phones, SIP trunks and VoIP Gateways to provide a full PBX solution – without the inflated cost and management headaches of an ‘old style’ PBX. Used by more than 30,000 companies globally, it has been recognized for its innovation and cutting-edge technology. Because 3CX runs on Windows, it is easily installed and managed by Windows IT administrators without the need for special telecom or Linux skills. It’s preconfigured to work with popular IP Phones, VoIP Gateways and SIP trunks saving you the hassle of having to configure and manage these devices. 3CX includes clients for smartphones and Mac or Windows laptops that allow users to use their office extension from anywhere, seamlessly integrated as if they were in the office. Not only are all calls to the office free of charge, but employees can leverage one single number and make a professional impression. With 3CX, companies can reduce their telephone costs by up to 70%, by leveraging SIP trunks, WebRTC, free calling to remote extensions and offices and reducing the number of rented fixed telephony lines. With the CRM integration agents get a customer name rather than a number. 3CX Phone System includes VoIP clients for Android and iOS which allow you to take your office extension with you anywhere. Answer calls via the office phone extension and transfer to colleagues without asking customers to call another number. Slash your companies mobile phone costs, increase productivity and make sure you never miss a call again!. 3CX features native Android and iOS VoIP clients that are continuously updated and tested and set the standard for mobile phone VoIP clients. With an inbuilt tunnel to avoid remote firewall issues, calling from over 3G or from any Wifi hotspot is extremely reliable. 3CX Android and iOS clients fully support PUSH, allowing the phone to be on standby and save battery life. Inbuilt SIP tunnel/proxy resolves any remote firewall issues. With the 3CXPhone VoIP clients for Android and iOS you can take your extension wherever you go. 3CX delivers the one number concept meaning that you no longer have to give out your mobile number. Set your status so your colleagues can see whether or not you are available to take a call. The 3CXPhone clients for Android and iOS utilise VoIP and are easy to setup and manage. The clients can be automatically provisioned from the 3CX Management Console, reducing help desk calls. Because of the inbuilt tunnel for Android and the available tunnel for iOS, the 3CXPhone clients work seamlessly across all firewalls, making them even more reliable. 3CX Phone System integrates powerful clients for Mac and Windows, allowing you to easily manage your phone calls, whether in the office using CTI and your deskphone, or on the road using the inbuilt softphone. Unlike other PBXs, no additional license fees are charged – and because 3CXPhone is fully integrated its easy to deploy and manage for the administrator, and easy to use for the employees. 3CX Phone System includes a CTI mode that allows you to control your deskphone with a few mouse clicks rather than having to learn a cumbersome cryptic interface. Launch calls on your deskphone without typing the number or transfer a call with a few mouse clicks. 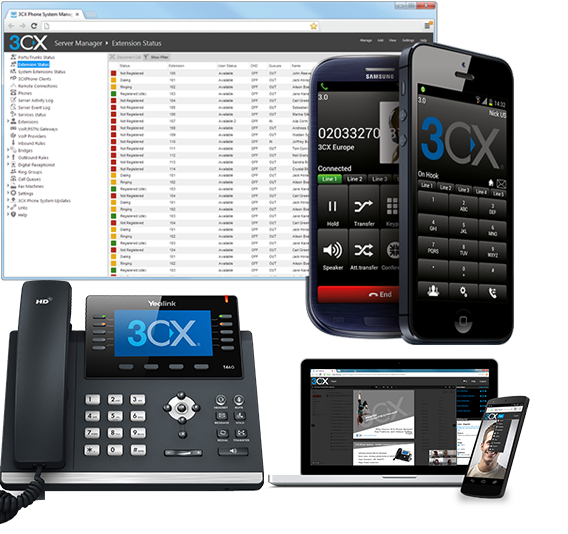 3CX Phone System includes an inbuilt softphone for Windows and Mac that allows you to make and receive calls via the office phone system from your computer, even whilst out of the office. Using a headset you can even use 3CXPhone as a full deskphone replacement. With 3CXPhone it’s ever so easy to set-up a conference call. You simply add conference recipients (internal & external) and schedule a conference call all with a few mouse clicks and via an easy to use interface. CRM integration with Outlook, Dynamics, Salesforce & Sage ACT! 3CX Phone System sets itself apart from the competition with its easy installation and management. Setup takes minutes and 3CX Phone System will run on an existing Windows machine (not necessarily dedicated) or virtualized in a Hyper-V or VMware instance. To configure an IP Phone, just plug the phone into your network and 3CX will automatically detect it and allow you to push out a configuration to it. 3CX clients for smartphones can easily be deployed via email, whilst software updates are automatic, eliminating help desk calls. 3CX automates configuration of VoIP Gateways & SIP trunks too. Inbuilt templates allow you to deploy gateways and leverage your existing phone lines without having to learn how to configure a VoIP Gateway. 3CX supports popular SIP trunks & VoIP providers with inbuilt templates, saving you a great deal of time. With 3CX you can manage your IP Phones from within the 3CX Management Console. Deploy new firmwares on many phones with a few mouse clicks. Guaranteed interop with supported IP Phones gives you peace of mind when updating your phones. The power of 3CX lies in the fact that it is entirely software based. Leverage your existing servers and take full advantage of their power and reliability, without having to add yet another difficult to manage “appliance” to your server room. Get easy backup and redundancy to boot with Hyper V or Vmware! Slash your Telecommunications Costs with IP Telephony! 3CX Phone System not only provides you with many new features to improve customer service and boost productivity, it will also cut your telecoms bill in half and give you the means to communicate with IP Telephony! Your phone bill will be slashed, but so will the cost of buying, expanding and MAINTAINING your PBX . Teleworkers or people working from outside the office can make calls free of charge – saving you significant charges. Connect remote offices by using bridges and all calls between offices are free. International DIDs and IP Telephony allow customers to call you cheaply and increase customer satisfaction. Traditional PBXs or indeed black box appliances are difficult to scale. Add more extensions and you are hit by licensing costs, underpowered hardware or you run out of ports. Not so with 3CX – add extensions, lines, features at no cost and avoid dreaded PBX replacements! No training is required to run the system as it’s Windows-based – unlike Linux based systems which require extensive training to manage and secure. 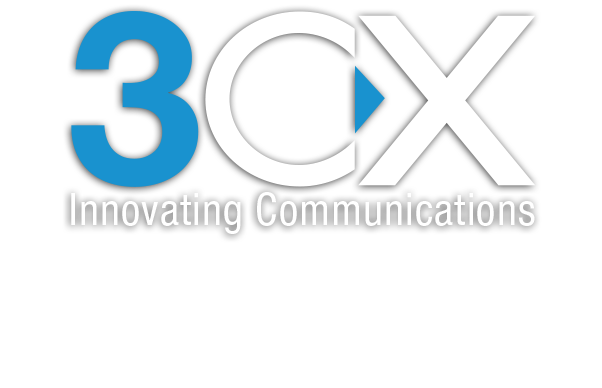 3CX WebMeeting harnesses Google’s revolutionary WebRTC technology, which enables video and voice communications to take place through the internet browser, meaning that participants will be able to seamlessly join meetings without the need to download any additional software or plug-ins. Fully integrated with 3CX Phone System, 3CX WebMeeting is delivered as a hosted add-on, meaning that 3CX customers can easily enjoy the web conferencing feature without installing additional server hardware or requiring additional bandwidth. Whilst meeting set up and configuration takes place locally, the actual meeting is streamed via our data centres, saving you the need for additional bandwidth.